Blu-ray Forum - View Profile: ROSS.T.G. Ross, i have to say, i wasnt expecting much but it was time to either get a new projector or get a new bulb after going thru about 8000 hrs with the Epson 5030ub. I just figured it was a lateral move with newer tech. I was blown away at the crispness of the images and how detailed they are. I turned on my xbox one x for the first time with the optoma uhd60 and i honestly had a moment where i said WOW out loud. I am truly impressed by the image and how quiet it is as well. I am very happy. Hey Ross. Awesome gallery photos. What sofa is that and where did you get it? Looks so comfy. Hi. 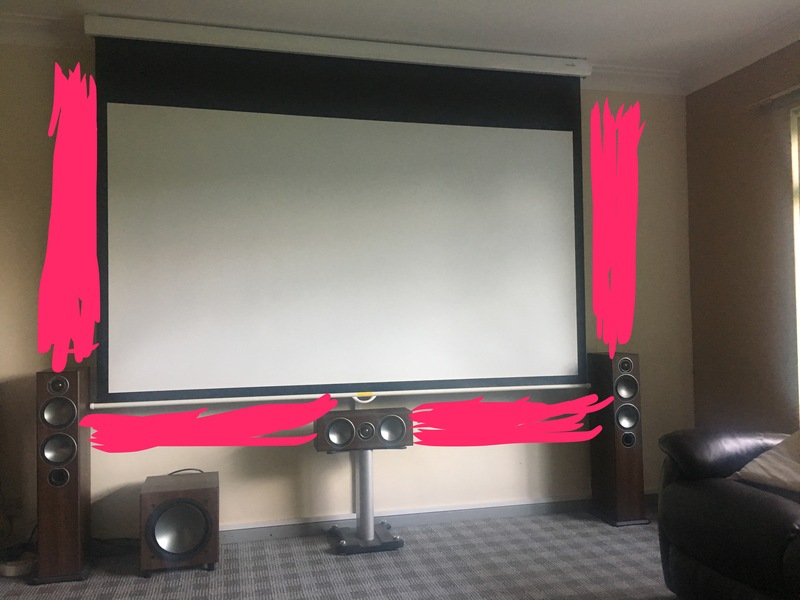 I have a question, what made you decide to switch to a TV over the projector? The reason I ask is because I have the same projector that you had and as of last week I am currently on my third lamp in under 18 months. Did you have the same issue? If not that's fine, I just thought I'd ask because you had the same one. Take care. Good stuff. The pic's look like it's a dedicated room. I was reluctant to paint it black but even with the lights on the room looks great. I really like the look. Drapes are a nice choice though, will look great. Thanks.....I'd love to paint it darker,always loved a deep red but at the moment no,I am planning on putting drapes up around the screen to help with the contrast. I do like how you have finished yours with the black,if I had a dedicated room then the ceiling and all would get done. That's kinda what I'm going for although that is more pink than the deep red I will use. Thanks for the feedback on my home set-up.....are the pics rotated when you view them? They appear straight when I view them. I spoke with Michael Chen who is a highly respected THX calibrator in North America and he claims projectors need to calibrated every 800 hours because they shift. So even hiring someone to calibrate is a waste of money if it means it's only accurate for 800 hours. I spoke with Calman and many people online and they all confirm that in order to get a truly accurate image you need a very expensive meter. That's why these guys charge $500. Their equipment is worth more than a new car $30,000. How can a cheap $500-$1000 compete with that. After learning this I reset my 5030 in THX mode and made no changes. Spears and Munsil shows no clipping of any kind. For the first time I'm actually paying attention to the movies I watch now and not on the image. My wife is also happier that I'm not fussing around anymore lol. So save your money and enjoy your beautiful new toy! Nothing is better than upgrading a projector! I'll be honest and recommend that you save your money on purchasing calibration gear. The reason is because cheaper light meters will not give you a more accurate picture than the default cinema mode that your JVC features. I SPENT $1000 on Calman and a cheap meter and the results are not accurate. The software shows accurate numbers but when I test with my Spears and WOW disc and blu-rays the image is way off. A cheap meter can't read dark grayscale which means I have red push and poor gamma tracking. I've spent sooo much time and money on calibrating my displays and I enjoy them much more in default picture modes like my THX mode in my Epson 5030. Skin tones, color, contrast looks much better and accurate. Avid Blu-ray collector, videophile and audiophile. Find all posts by ROSS.T.G. Find all threads started by ROSS.T.G. Find all thanked posts by ROSS.T.G. Find all posts thanked by ROSS.T.G. View full profile for ROSS.T.G.